This article was published by Kyle Patrick (@SlipZtrEm) on January 24th, 2019 in the WRC Series category. epic_apri_39, Theiceman1, Cowboy and 7 others like this. @MrCrynox nearly spoiled the surprise. I was really glad to hear this. WRC7 remains the highlight of my E3 2017 visit, simply because it surpassed all expectations. It's such a fun title, and was such a big jump over 6. With twice the time between that and 8, I have high hopes for this. GregOr1971, perja55, Gregfranklin and 2 others like this. ...I’m pretty sure everyone knows how much I’m screaming like a loony over here. I couldn’t be more here for this. I’m already there. They already have my goddamn wallet. TheNuvolari, Cowboy, GTPVenomZombie and 5 others like this. This Sounds promising with the extra development time and the Dynamic Weather, however, let's hope they can improve on the frame rate issues (30FPS) from WRC 7, and the FFB on the Thrustmaster T300 on the PS4 Pro. Would love to have this running at 60 FPS and more FFB feeling. Anyway I'm really hyped for this, I really enjoyed WRC7, I'm so looking forward to this, (much more than DR2), the changeable weather is a nice addition and after witnessing the evolution of the KT graphics engine from WRC7 to V Rally 4, is gonna be a looker as well. Woot! WRC7 was a real surprise and and I can’t imagine this not being better on all levels. And we’ll have Dirt 2.0 to tide us over until September. GTPVenomZombie, pg33, MrCrynox and 1 other person like this. Good, I hope they now put the mess that is V-Rally 4 well behind them. This is great news. WRC7 was so much fun to play, especially on a wheel. I hope the epic stages will be returning. Kylotonn again. They should stop making racing games. I'm tempted to get this game after hearing it will have dynamic weather. I love racing games that have it and day/night cycle, heck, even Forza jumped on the same boat. Looking forward to both WRC 8 and Dirt 2.0.
pg33 and Scaff like this. I'm happy that they included Turkey on the trailer. It looks fine. And also they did not forget to add those rocks, LOL. No idea , its horrible in comparison to 6, and particular 7 (which is a great title). That said, I still technically own it, as I bought it digitally, its just not downloaded onto my PS4. Why? The progress they made on the WRC series between 5 and 7 was fantastic, with WRC 7 being a solid title with some the best stage design of any rally title around. Cowboy, Nowax, paulpg87 and 7 others like this. The graphics look gorgeous, & it's nice to see stages that are realistically narrow. However, the physics don't look quite right imho, the way the cars are moving. Dynamic weather is seriously tempting though! Quattro20v, MrCrynox and Scaff like this. GregOr1971 and perja55 like this. If they go with the style of replay in VR4 then expect an improvement. It's not perfect but definitely better than WRC7. You see a lot more external shots of the car. I have WRC 7 sitting on my Steam account which I still haven't got around to playing Here's hoping they keep the ultra long stages as that was the main feature that led to my purchase of 7 (the first in the series that I bought). I must have played a different WRC7 to everyone else. Horrible on a pad, horrible on a wheel, dull stages. I mean this trailer looks good but I'm taking it with a huge pinch of salt. Keeping the epic stages is a must. I restarted a career at the weekend, and ran the Monte, the 18km stage on that is a workout an a half. Physically and mentally. 305Michael305, LeGeNd-1, doblocruiser and 5 others like this. Clearly you must have. One of the nice surprises of 2018 IMO. paulpg87, doblocruiser, MrCrynox and 2 others like this. MrCrynox and Scaff like this. Time flies when your are having fun or should that be all years seem to roll into one when you get as old as me! Thanks for the correction. MrCrynox, Pfei and Scaff like this. My experience is the complete opposite. Easy to play on a controller and the best stages seen so far in a rally game. I'm clearly in a minority. Don't get me wrong I have given it a go, put around 22 hours into it so I can't say I haven't given it a fair crack. Just couldn't get on with it on pad, maybe someone could share their pad settings and I'll try again. Stage wise, whilst I appreciate a long stage and clearly effort has gone into making each rally feel unique and feel like the country it's representing, for me they just feel some way off SLRE and Dirt Rally in terms of character, I haven't done a stage in it that makes me thing, ooh I need to go back and do that one again like in the other games I've mentioned. Maybe dull was a harsh term but they don't quite excited me enough. Again perhaps my experience on the control for the game has hampered the enjoyment but hopefully someone can help me out there and maybe improve it's standing. @MagpieRacer I checked my controller settings. TBH everything is stock except steering sensitivity, I reduced it from 35% to 25%. Apart from this I set the cars up to oversteer under power & braking & adjust the gear final drive to suit the stage. That's about it. Personally I've had as much enjoyment out of WRC7 as I've had out of SLRE & DR, from this perspective I like them all about the same, but I absolutely love the fact WRC7 has the up to date cars and all the rounds. 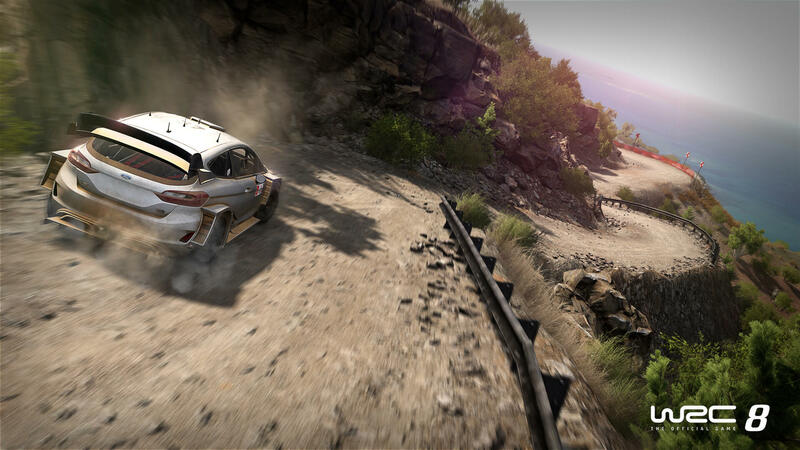 Between the apparent pivot-steer in gameplay videos of WRC7 and V-Rally 4, the mixed reception of VR4, and some mixed comments on WRC7 like from @MagpieRacer, I don't know what I could expect from this game. Meanwhile, I am tired of the twitchy nonsensical handling of Codemasters games, and I am flat uninterested in DR2.0 since Codemasters opted to give up on the best redeeming quality of Dirt 4, the underdeveloped Your Stage feature. I'm also kinda tired of the repeated inadequacies in Milestone's games, which turns me off from Gravel and tempers my enthusiasm for the possibility of an SLRE2. As with VR4, I would love to support a game like this on the Switch, at the very least. The promise of "a few historic models" in the car list gives me hope that it could add a few cars more to my interest than contemporary WRC competitors that are more-or-less irrelevant to me as someone who doesn't follow the WRC, or any motorsport, really. At least since Subaru bowed out from factory-backed competition.